It’s come and gone but as usual will leave lessons! Want to see what I learnt from Euro 2016? Read on. . . It was Ronaldo’s first injury and then the second… I saw fans clapping but deep within, their chance to sing the victory song was about being blown! He managed to be back in the game and then nature caught up with him… There he was on the pitch troubled, dejected and crying. The one who captained his team, cheering them to victory is down! If you’re lost, I’m narrating the Euro 2016 Final between France and Portugal yesterday’s night. Cleared now? Then lemme continue. 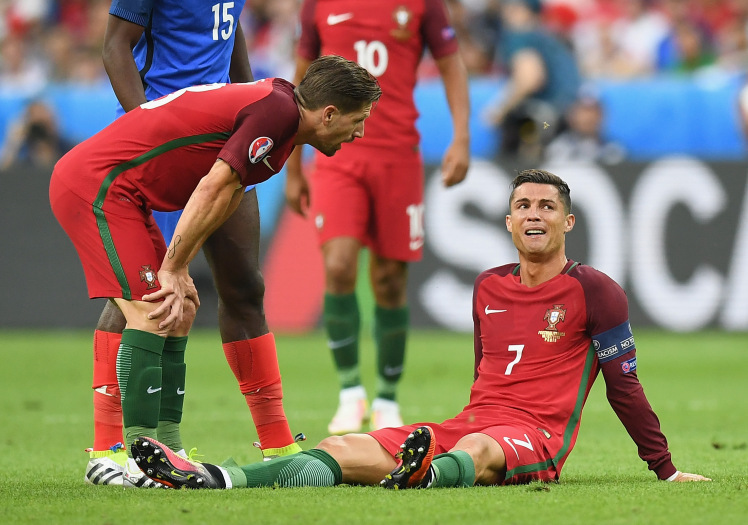 I remember Portugal left the group stage as the best loser – they performed woefully at the start of the tournament. And I’m sure they would have vowed to kick-start with a covetable performance. When their sight of victory was becoming deem, and instead of sinking ahead in defeat, they rather kept hope knowing that no winner was announced yet. On and on, favour shined on them then the rest is history! Who won Euro 2016? Portugal! Ronaldo has been his team’s major saviour since the beginning of the tournament. Every hope of winning was pointing towards his indubitable prowess. And, of course, he would have vowed to score against France and eventually lift the cup. France had more chances and winning opportunities were many for them than their opponent. To heighten Portugal’s fear of loss, France hosted the cup! Now let me talk to you. Remember your goals for this year? Remember how you promised yourself enough prowess that’ll attract the prying eyes of the blind, tingle the deaf’s ear and make the dump testify with you? Remember how you began to give up when unseen forces started coming against your plans? Remember how some of your best chances for victory were blown off too? And How disappointment rolled in, the economy got bad, family and friends joined in the race for self-limitation? I even know that your best shot for success was crippled. Looking back and forth, you are not seeing yourself on the radar of victory! Wait… *Who fear and faithlessness don epp*? (Who has fear and faithlessness helped? Your calculator won’t give you that answer! Victory is still possible this year. You will still have your forethought desire…. All dashed hopes will still come alive…. If, and only if, you’ll stop looking at the situations around you! Just surrender to God and He’ll help in the race. Even when your seemingly best shot is gone, (like Ronaldo was off the pitch) there’s always a substitute! Believe and it’ll be well with you! Now that is brilliant my bro… Trust me I was supporting German but when they lost to France I moved to Portugal and you are right because after Ronaldo was substituted I thought it was done with already but only realised after the 90th minute whistle that Portugal still held France. Portugal made an unfavourable situation to be there own advantage because they were inspired and kept believing as you said, no winner was announced yet. You are inspiring my bro, I wish you were around to feed me with lots of such energy. I have lots of unfavouring situations that depress me most times, thanks for being there dear. Great lesson learnt indeed who would have thought Portugal would win the trophy?